Sisters Middle School's record-setting monarch butterfly "Journey" is back in the news. Professor David James, of Washington State University in Pullman, Washington, who issued the numbered tag placed on the underside of the butterfly's hind wing, is keeping in touch with researchers in Carpinteria, California, who originally reported the butterfly's arrival. 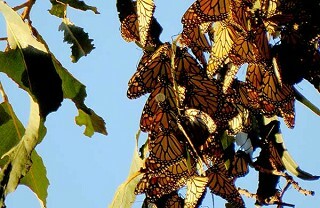 They went looking for Journey, and found him among the 30,000 other monarchs wintering there. There were no brass bands playing, "Farewell, Journey" when science teacher Susie Werts opened her hand; the butterfly just jumped into the air and immediately headed south, toward the wintering areas he had never seen in his life. The only special equipment Journey has (that we can see) is larger wings and stronger flight muscles than previous monarchs. For some reason not fully understood, the last batch of Monarchs hatched from the eggs of late summer has larger and darker orange wings. Perhaps the melanin in the dark scales also makes them stronger, and the combination of brighter, bigger and stronger wings is what's required for the arduous journey; first south, then in the spring back north again. Journey's trip north will go only as far as the first milkweed patch. There, he and his partner will mate and she will lay the eggs that will become the 2017 generation of monarchs to begin their voyage to their summer haunts. At that moment Journey's magnificent adventure will come to an end. He will have lived out his long life, made the voyage south, spent the winter in the warm climate of California, started back north and taken part in the creation of the new generation of monarchs that will eventually arrive back where he started his life near Klamath Falls. How did Journey know which way is south? Was it just chance that he went south and no other direction? When we look at the impressive journey monarchs make, perhaps the answer is "no." The strongest suggestion about Monarch migration is that it's instinctive; they have accumulated a "genetic memory" that is passed down through the generations. It's a memory that takes into account the terrain they fly over and through, such as mountains, rivers, freeways, lakes - and obstacles. Once they arrive in an area that has no harsh weather condition that would endanger their survival, and the position of the sun fits into that genetic memory, that becomes a wintering site. There are many more theories to be worked out. The bottom line is Journey made it - and set a record doing it. "From Sacramento I would guess he would have traveled south through the central valley, Stockton-Modesto-Fresno. Then he crossed the coastal range at some point - maybe Highway 41 from Fresno to Paso Robles? As well as river valleys, monarchs sometimes follow roads... Presumably this road goes through a pass. Then he would find San Luis Obispo and continue down the coast to Carpinteria..."
Did Journey actually know where he was going, or was it pure chance that his trek to the safety of the migrating trees and warmth ended safely. Who knows? The bottom line is he made it, and he will be one of tens of thousands of other monarchs who has played their part in the preservation of his species.